As the rest of the garden winds down for winter, containers come into their own. With a few large pots, a bag of good-quality potting mix and a couple of punnets of annuals, it’s easy to create a winter garden. Upgrade the punnets to ‘bloomers’ (small single plants in flower) and the potted garden provides instant rewards. I have a sunny sheltered spot beside the front door, which is the ideal space for a potted garden. 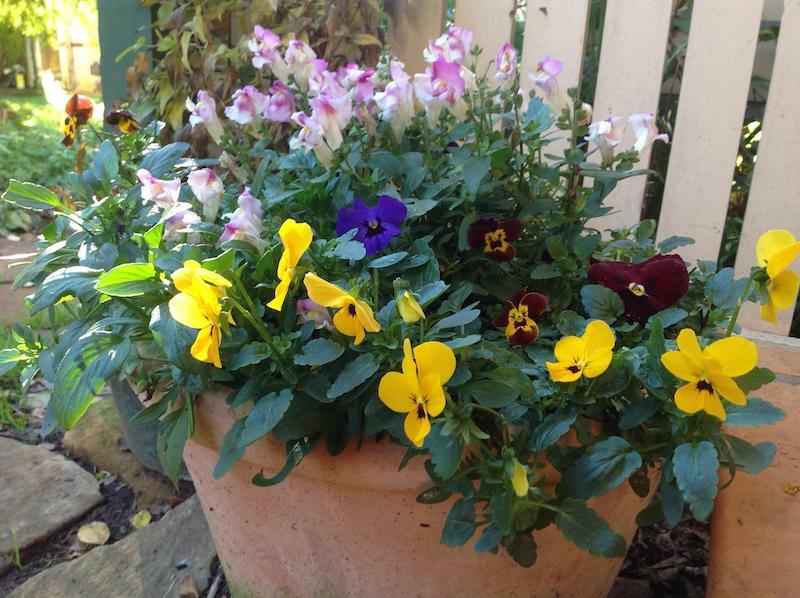 At the moment the large terracotta pots are planted with a cheerful mix of pansies, lobelias and dwarf snapdragons. If your sheltered spot isn’t sunny all day, fill the pots with shade-tolerant winter-flowering annuals such as primulas or cinerarias. One of the best looking of the plants in my doorstop arrangement is a cineraria that survived from last winter’s display. It was cut back and left and this season has produced lots of new growth and flowers. Many of the plants we grow as garden annuals are capable of living longer than a season as they are technically short-lived perennials. The annuals in my potted garden are concealing layers of tulip bulbs, which will flower in spring. 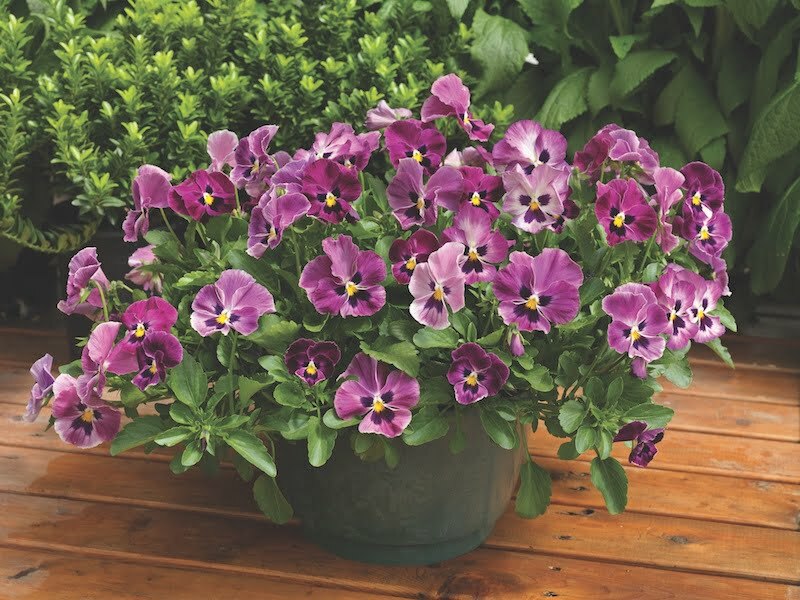 When they finish their show, the pots will be replanted with summer annuals such as petunias or their more petite flowered relatives calibrachoa (also sold as Million Bells). Also good in pots over summer are dwarf bedding salvias (Salvia farinacea also called mealy sage) in blue or white and small pompom dahlias. Regularly deadheaded, all these summer ‘annuals’ last well into autumn. Vegies in pots too: While I’ve planted flowers for colour, you could also plant for eating. Large pots can produce a bounty of vegies over winter if planted with kale, English spinach or loose-leaf lettuce. Calendulas, which are also called pot marigolds, can also be grown for colour and to use the fine yellow or orange petals to add a bit of zing to a winter salad. For a real feature, pop a climbing frame into a pot and plant a couple of snow peas. Peas combine flowers and pods with quick growth that’s a real winner over winter. Caring for potted plants: Despite being small and compact, pots need a bit of work to keep them looking good. When the seedlings are first planted, water them in with a seaweed solution (follow the recommended dilution rates on the container) to get them off to a good start and reduce transplant shock. Whether filled with edibles or ornamentals, the pots need to be watered regularly – especially if the weather is windy and they are sheltered from natural rainfall. Help all that growth along with fortnightly doses of liquid fertiliser. Regularly deadhead the spent blooms on ornamentals to encourage more flowers and pick any leafy vegies. When flowering potted plants look straggly or stop flowering, a light all-over prune stimulates new growth and, within weeks, more flowers. Keep the plants growing as long as they are looking good. 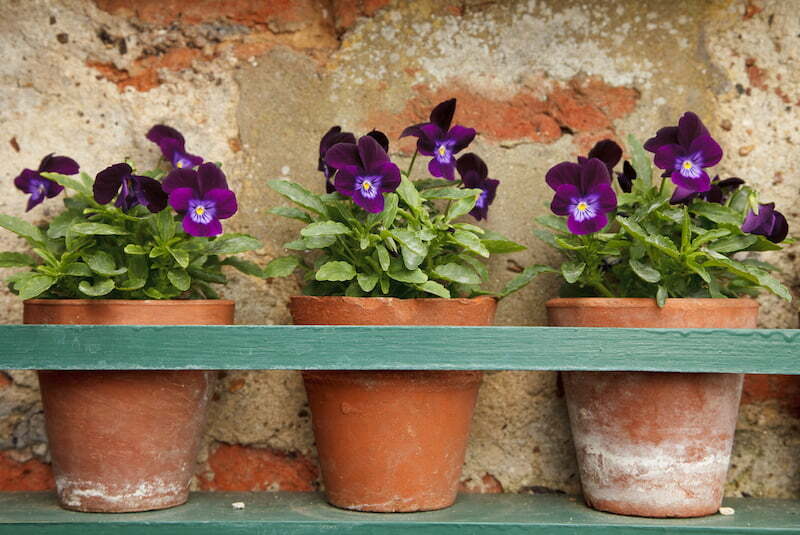 Once they’ve become tatty be bold, pull them out, replenish the potting mix, and start again with summer annuals.